What always seems to perplex me when reading about beauty boxes is not only the variety of products (which companies are paired up with who) but also the speed at which your box is delivered. Although the actual dispatch service by Glymm and Canada Post is always fast I'm always a little envious of beauty box services that send them out early. It makes sense that if this is a February box, shouldn't customers be receiving them at the beginning of February instead of the end? Well that is something to think about. My GlymmBox for this month did arrived yesterday and here is what I found inside...a relatively bare box compared to previous openings. Of course what caught me by surprise (as I'm sure it did other people as well) was the sparse selection in this months box. I am still grieving the loss of the jelly beans which have been gone since last month which I felt was an unwise move by Glymm but nonetheless I had expected the continuous quality and scale of the products inside. Natural lip gloss "Tiger Lily"
Gives lips a hint of colour with a soft sweet flavour. Voted best new lip product by consumers. 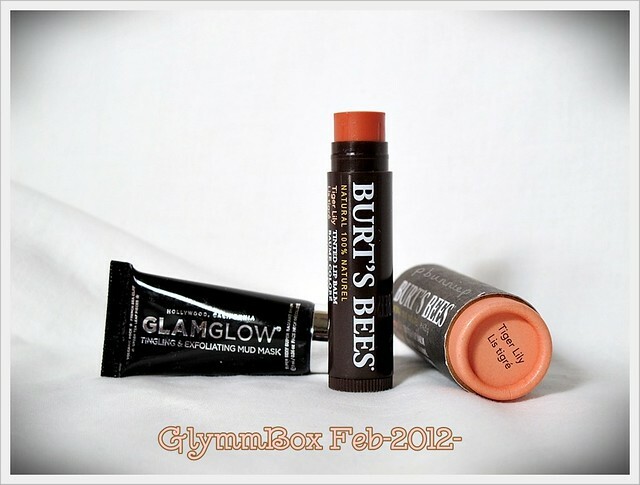 My first thoughts: This lip gloss is one of the two full sized products in this month's Glymmbox however Burt's Bees is not what comes to mind when I think about luxury beauty. With the "luxury drugstore" price tag of $8 it is an expensive item in relative terms but this seemed like a downgrade in comparison to what is advertised to be offered by Glymm. On the bright side, since trying out some of their products during the holidays I am on good terms with Burt's Bees and another lip balm is always welcomed in my purse. Tingles, tightens and lightens in 15 minute. Volcanic rock, French sea clay and real pieces of green tea. My first thoughts: Just to be fair monetarily Glymm does include a sample of something ridiculously expensive. As I'm reading the description card, I begin to think how many people would actually pay that amount of money for a 50ml jar of face mask...no many I would think. One jar of this miracle mud is the equivalent of an entire line of well functioning skincare range for me. The product itself doesn't sound immensely appealing either as ingredients like French Sea clay and Green Tea can be commonly found in products costing half as much. Lightly powdered bronzing paper eliminates oil and gives you a glow. Easy to carry around in your makeup bag for touch ups. My first thoughts: These blotting blush/bronzer papers have been previously featured in GlamBag (created by Michele Phan and company) so I was already aware of this product. In fact I was quite enthusiastic about products being produced in different application methods. What came as a surprise was realizing that there were only two pieces of the paper in the bag. How that is considered a deluxe sample I would never quite understand. I'm not aware who decides the quantity of each sample however those included in the GlamBags were much larger booklets although not the full size. I feel that it would be hard to convince people to love a blush/bronzer from two applications. Flirty, fun and easy to use eyeshadow from Sula Beauty. Long lasting and easy to blend, made with natural ingredients. My first thoughts: Having previously tested out a lipgloss from a Glymmbox before, I was curious to try out more products from Sula Beauty. It had always been in my mind that perhaps "natural makeup" won't be as fun or good quality as others on the market. However after a wonderful experience with Sula's lipgloss I was more open to other options. This full sized eyeshadow was packaged beautifully, simple but not boring an easy to open plastic case. Personally the downside would be the colour which is not a shade I would wear often. Perhaps in the future there might be a Sula blush sample! 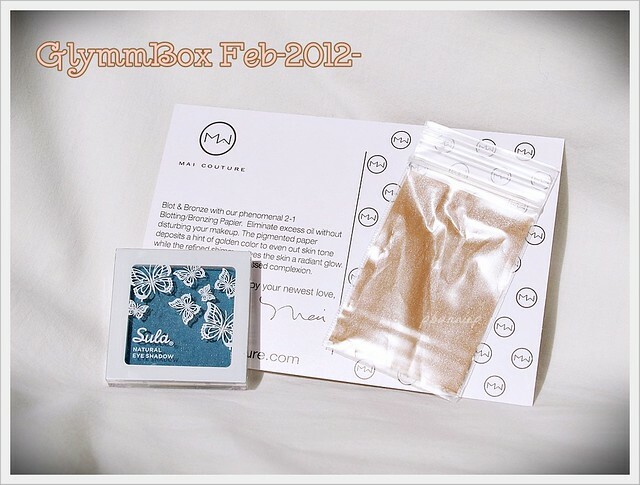 Overall February's Glymmbox was lackluster to say the least, the most exciting for me being the eyeshadow although it's not a common colour for me (perhaps that is a good thing). I currently have doubts about continuing my Glymmbox and might consider switching to something else (I already canceled LuxeBox). what beauty box you've been loving! I still haven't received my box yet =( It does seem quite disappointing compared to previous months. Oh well, I suppose they can't be amazing all the time.